Stardust is the all-new game from Microgaming that takes you far into the stratosphere to a world of black holes and rare gemstones. 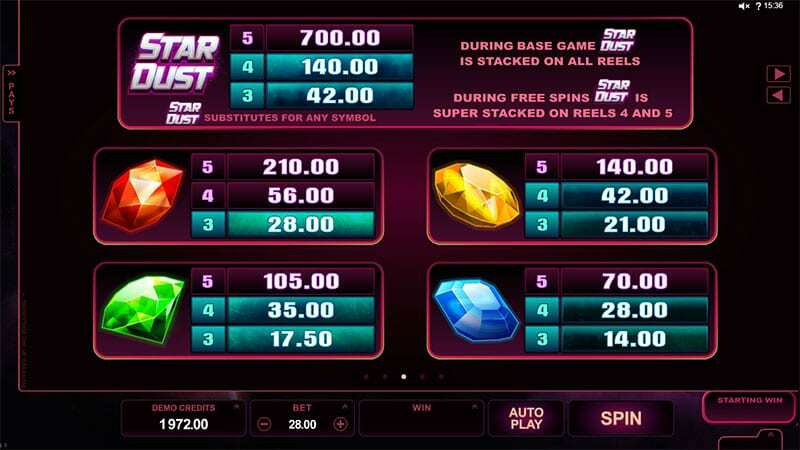 This play slot online is similar to Starburst in its design and will be sure to set you on your path to a wonderful range of free spins and cash rewards. Microgaming is one of the biggest names in the online slot industry. Their titles stretch far and wide across the globe and have reached some of the most prominent online casinos across the world. Apart from Star Dust, their titles include Hot as Hades, Jungle Jim El Dorado, Tarzan, and many more wonderful video slot titles. They've gained an immense amount of popularity within the online slots community and rightfully so. Consistently releasing high-quality slot games each and every month to their army of fans. Check out these slot games developed by Microgaming! The name pretty much gives this game away; as expected this game includes a space-age theme that takes you high up above planet earth and into a world where only free spins, cash prizes, and bonus WILDS matter. In addition to its space-age theme, It has that 1980s arcade style aesthetic that will be certain to take you back to that nostalgic period of your life where it was only space invaders and Pacman that ruled the roost. Make sure to read details below, which can help you to win as you learn more. Furthermore, Star Dust has 5 reels and a wonderful 40 paylines to take advantage of, the more paylines in effect, the more chance of winning some amazing cash prizes. The main symbols to take advantage of while playing starburst are the playing card symbols which form the lower values on the game. Throughout the game, you’ll notice a wavy, ethereal line that hints at the paylines, this can sometimes be annoying, but for the most part, it’s nice to look at. In addition, the coloured gems that hover across the reels represent the higher valued symbols on the game. The blue, red, green, and yellow are the symbols to look out for. The Star Dust symbol is the one that is going to be your pick of destiny. It will shoot added gemstones onto the game board increasing your profits and chances of hitting the jackpot. As more and more gems are collected and stored the STARDUST METER will fill to the brim. Once 10 gemstones are secured this is when you win your cash prize, you will also be granted permission to enter the FREE SPINS bonus round. Once you’ve beat your way out the stratosphere you can enjoy the free spins round at ease and take advantage of the SUPER STACKED WILDS and the RADIANT RESPIN feature. It's quite a unique game considering its simplicity. Star Dust is a mind-bending slot from developers Microgaming. Its aesthetic appeal is something that will attract the nostalgia of all 80s arcade players everything in addition to the new slot players of today. The unique Stardust meter will set you on your path to riches and you can take advantage of a wonderful range of special respin features and cash prizes that are on offer when you play this amazing game. If you liked this slot you might also like Blood Suckers II.